Europe is not taking into account what is really taking place in Hungary — and there is nothing wrong with the rule of law in the country — because “the West really needs bad boys” to hold up as a negative example, Hungarian MEP Gyorgy Schopflin told EURACTIV Slovakia. 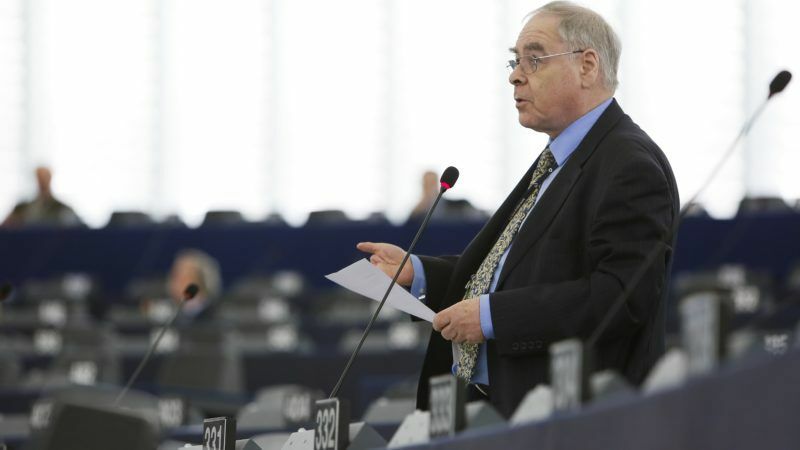 Gyorgy Schopflin is an MEP for Fidesz (EPP). He spoke to EURACTIV Slovakia’s Zuzana Gabrizova in Košice, Slovakia, on the sidelines of an international forum. Slovakia and Hungary are members of the EU and partners in the Visegrád group. What we hear increasingly often is that V4 is now more “2 plus 2”, as Slovakia and to a lesser degree the Czech Republic say they want to be part of new integration projects in the EU, which is not the case in Hungary and Poland. What is the Hungarian view on this fragmentation within the V4? There are some political divergences, but there always have been. These are temporary blips, but in reality, the Visegrád cooperation works very well. My own position is that a part of the liberal left would really like to destroy the Visegrád group. First of all, they are terrified that Andrej Babiš will take the Czech Republic in the direction of Hungary’s so-called “illiberalism”. This is the left-liberal discourse which overplays the divisions in the Visegrád four. Structurally, Poland is a far more important country than any of the others. The V4 cooperation has been working around relatively low, often almost invisible levels of cooperation. And it has actually created a certain dynamic of shared ways of doing things. And what I would stress is that Visegrád is particularly important in Brussels. It does not mean they agree on all issues, but the Visegrád group is recognised as an entity and is probably accepted as more cohesive than the Benelux or the Scandinavians. Because it is more cohesive. It did not start out that way but I think it was the recognition in Brussels that actually four countries together add quite a lot of weight to what is happening, especially in the Council. Visegrád cooperation within the EU goes back 13 years now. During those 13 years, certain habits of mind have developed and even when the politicians may disagree, I think it is still possible to cooperate. You have not mentioned Slavkov. I think Slavkov is pretty much dead. It was the project of three social democratic governments. One of those is no longer a social democratic country (Austria). I’m not sure whether Smer is really a social democratic party, but I am not going to argue about this. And we have no idea what is going to come out of the Czech Republic. It is the idea of the left, that Visegrád is very bad because it gives cover to Kaczyński and Orbán, therefore, we must try and destroy it. Hungary which has the presidency of V4 is doing a major conference, I think it will be held on 26 January, on the future of Europe that I think will be quite successful. You wrote an article where you are trying to explain the West’s inability to understand what Hungary is trying to achieve in Europe. It was at least a year ago. That was my position then. I would go further now. Now I would say it is unwillingness. For example, in Western media Hungary is written down as the country of illiberalism. My question is: How many times has Orbán used that word? Once. It was enough to penetrate the European discourse. The fact is that he used it within a very specific context, the context of etatism and economic policy, but it has been given a content through attribution by Western politicians who maybe do not have so much idea what is actually going on in Hungary. Why? Because the West really needs bad boys. They can say – well, maybe things in my country, whether that is France, Germany or Netherlands, are not going well, but it can be so much worse and look, there is Orbán with illiberalism. So, they no longer look at Hungarian realities, but have created an imaginary Hungary where everything is awful. What are the realities in your view? How many journalists are in prison in Hungary? The answer, of course, is none. How many laws have the Hungarian constitutional courts sent back to parliament? Well, it is about a hundred  in the last five years. The Hungarian constitutional court is very active, by the way, it is in a much better state the Slovak Constitutional Court. The Slovak Constitutional Court is sort of functional, you have 10 judges out of 12. We do not have the problem, even Frans Timmermans (first VP of the European Commission) acknowledges that. It is a mess in Poland. And incidentally, there is a really major problem in the Czech Republic. The judgements of the Constitutional court are routinely ignored by the Supreme Court. This does not apply to Hungary. The relationship between the Constitutional Court and the Supreme Court is very good. Every year the European Commission publishes a judicial scoreboard. Hungary does quite well, it is in the top third. The only effective point of criticism is that Hungary is a bit slow in implementing the money laundering directive. Basically, there is actually nothing wrong with the administration of law in Hungary, but the Western journalists I talk to simply ignore it when I say this. The narrative is Hungary is a very bad boy, and we have all seen how it seduced the Poles. The narrative has to fit with what the Western liberals think. The fact that there is quite a lot of popular support for the government is regarded as elite manipulation. If it is elite manipulation, are people really that stupid? Don’t you acknowledge that the Hungarian government is using an unorthodox way of communicating some of its policies? For example, the public consultation on the so-called “Soros plan”. I see public consultation as an instrument of democratic participation. I don’t question that, but don’t you take issue with the phrasing of the questions introducing the so-called Soros plan? Look, no question is ever innocent. Every question will have attributed content. Yes, some of those questions, I am prepared to accept, were not very open. And probably two questions would have been enough. I think it was about ten in the recent round. But basically, the idea of national consultation goes counter to the narrative of populism. I think it runs out at the end of next week, the 24 or 25 November and over a million forms have been returned. It is about one-tenth of the electorate. I am inclined to say that it is not a bad instrument, but there were also complaints about whether we should have the referendum. There are also complaints around when we have an election. As you certainly know, the party-political scene in Hungary is in a catastrophic situation. We do not have an opposition, or insofar as we do have it, it’s Jobbik. The left has utterly destroyed itself. I have still to see a viable left-wing alternative to Fidesz. They don’t come out with any policies, any strategy, let alone even a discourse. Do you think the fact that the only real opposition is Jobbik, as you say, has changed Fidesz’s narrative or policies? Jobbik is the primary opposition. Have a look at some of the Jobbik websites, they are hair-raising. They are full of violent aggressive attacks on Fidesz and the left. That is where the real opposition comes from. Also, whereas when Jobbik first started to appear in the Hungarian parliament there were pretty amateurish, now they are very impressive, which worries me. I do have the right of audience in the Hungarian parliament, I do go to committee meetings mostly, once or twice I have even spoken in plenary. I don’t like what the Jobbik people are saying, but they put good questions, they are well-informed, they understand what they are talking about. I am not so sure that is true of the left. So, what are we talking about? In the long-term historical sense, the left has yet to recover from the disaster of communism, from its own incompetent term in office (2002-2010) and in a way from the exhaustion of the social democratic project. Last week the Slovak president addressed the European Parliament. The same day, the Slovak parliament speaker was in Russia, addressing the State Duma. In views of many, it exposed divergences in Slovak foreign policy inclinations and orientation. A few weeks ago the prime minister, the speaker of the National Council and the president issued a common statement about Slovakia’s European orientation, sending a strong signal despite their strong personal differences. How do you think this is being read in Europe? You yourself are a member of the delegation to the EU-Russia Parliamentary Cooperation Committee. I have heard President Kiska’s speech, quite interesting. Interesting that he had delivered it in English. I was somewhat surprised. The fundamental problem for all central European countries is: what the relationship with Russia is to be. Russia is changing. We, on the other hand, are stuck with the energy situation, to some extent other economic connections with Russia, which by the way does include the activities of SVR, the Russian secret service. Well, Russia has soft power. This is something we forget, that it is not just the West that has soft power. Russia has become really active in creating a Russian narrative which is there to confuse Western opinion. At the same time, I think Slovakia is in the same position as Hungary, the relationship is transactional, not ideological. That is to say – we have to do deals with Russia because of the energy issue. The Hungarian position is that we do not really accept what Russia stands for, but we accept that in the fullness of time the European Union has to come to terms with what Russia is. Not just in energy, but all the other things. Hungary especially doesn’t have an alternative, because of the energy supply, but to do deals with Russia. I imagine Slovakia is in the same category. I know that Zeman in the Czech Republic says that Russia is wonderful. I don’t know if he really believes it. But at the end of the day, some kind of relationship between central Europe and Russia will remain. What about Ukraine in the meantime? Ukraine is a very serious problem. Certainly, it is serious for Ukraine itself and for security in Europe. With the incorporation of Crimea into Russia, Moscow has torn up the Helsinki Final Act, that frontiers are inviolable. There are lot of issues with Russia that we will need to handle. You said that you are confident that Brexit will happen in March 2019. Do you believe it will be a hard one or it will be more of a reconfiguration of current relations? I am fearful that it will be a hard one. The problem is that there is a current of opinion that wants it to be a hard one. There is Sir William Cash, he is a British MP, I know him fairly well. I remember being in London with an official European Parliamentary delegation and he said, “We want out, whatever the cost.” You cannot argue with people like that. For them, that’s the Holy Grail. There are also softer Brexiteers and there are Remainers. Let’s look at this hypothesis, that for whatever reason the British government says before March 2019 “we reverse, let’s go back, we will stay.” But they won’t get the same deal, they won’t get the same opt-outs, they wouldn’t get the special deals, they wouldn’t get the rebate. And I think no British government will be able to accept that. I think it is unlikely, but hope I am wrong, that at the December summit this year the Council will find that insufficient progress has been made. The deal regarding citizenship is the easiest; Northern Ireland, which is nearly impossible, but ingenious wording would do it. The money that the UK owes the EU is actually easy, if only the Brits were ready to pay. Then the negotiations will go to the next phase that is trade relations, where I imagine elements that could look like CETA, the Canadian deal. But you cannot be both a member and not a member of the single market. So how do you preserve the value chains? I have no idea. The Brits think that the Germans will help out. No, they won’t. For Germans, the EU is more important than the United Kingdom. Illusions all the time. Fascinating. That is what keeps me awake at night and gets me out of bed in the morning. Insane western media might depict Hungary as the bad boy..but western public sees Merkel as the evil woman putting Europe on a course to Sharia (you know Muslim majority, death to apostates and blasphemers, feminists forced back into the kitchen, etc, etc), and Orbán as the guy putting up a wall against this evil death cult!